The NZD/USD is trending higher on the larger time frames. The W1 time frame is shown below in the image. Current resistance and price alarm point is at 0.7305. The next resistance level is at the 0.7500 – to 0.7700 level as noted on the chart. Forex traders can set an audible buy alert at 0.7305 on their trading platforms. Then when the alert hits you can verify any buy trades with The Forex Heatmap®. 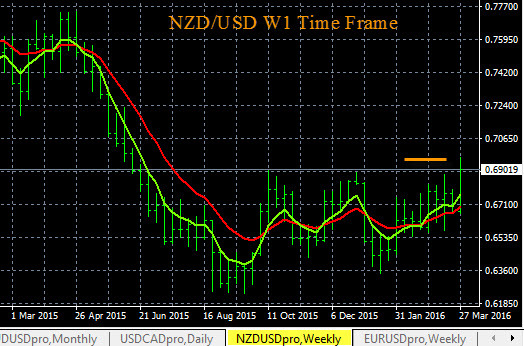 The NZD/USD is trending higher on the W1 time frame. Current price alert point is at 0.6945, traders can set an a price here. When the price alert hits check The Forex Heatmap® for a confirmation buy signal. Past the alert price there is no nearby resistance and considerable upside potential. We use current trends and support and resistance levels to help us build all of our forex trading plans for 28 pairs. Today in forex trading the USD (US Dollar) was weak on all pairs, see the live trading signals below from The Forex Heatmap®. The EUR and NZD strength that was also in the market drove the NZD/USD and EUR/USD higher. The EUR/USD is likely going to continue higher to the 1.1050 resistance area on the H4 time frame. The NZD/USD also moved higher on the H4 time frame but we cannot tell if it has further upside potential. On the NZD/USD traders should consider scaling out lots on any profitable trades. The Forex Heatmap® provides live trading signals for the USD pairs, but it also provides signals for a total of eight groups of currencies and 28 pairs total. It is a live indicator that assists with trade entry management with the easy to read signals and arrows. 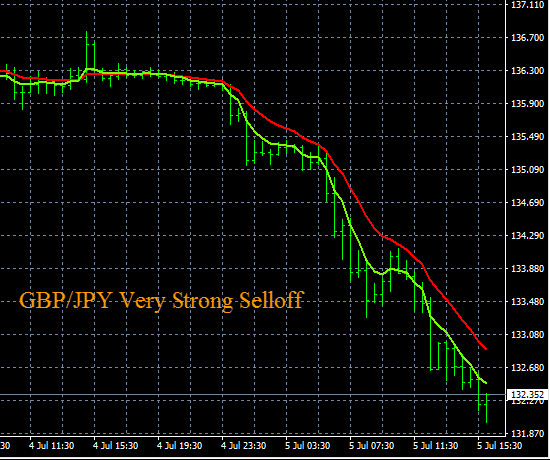 In this article we will present a currency strength strategy for forex trade entries and another strategy for market analysis, both strategies work. These two strategies will improve any trader’s understanding of the current market condition, along with more much more profitable trade entries, trade after trade. Measuring the current market momentum in real time is one currency strength strategy. In the example below the USD (US Dollar) was weak on all pairs. This drove significant movement for traders on this day (2-3-2016) on all seven of the USD pairs we follow at Forexearlywarning.com. There was also some minor NZD (New Zealand Dollar) and CAD (Canadian Dollar) strength in the market. So the NZD/USD moved strong to the upside, makes perfect sense. 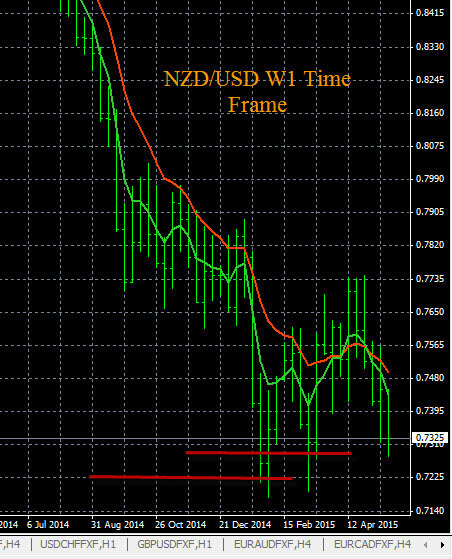 Since the NZD/USD was also in an uptrend at this time, it should continue higher on the D1 time frame to the 0.6800 resistance area. This is another example of how to use intra day currency strength for strong trade entries. This example is from 7-5-2016. 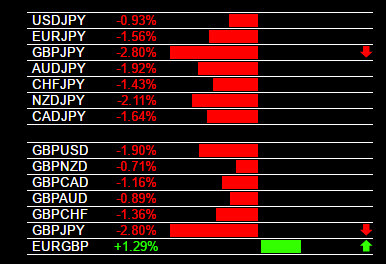 On this day the British Pound (GBP) was weak on all pairs, and the Japanese Yen (JPY) was strong on all pairs. This caused a strong sell off on the GBP/JPY. This pair sold off over 300 pips in one trading session, also, the major trend on this pair is down on the larger time frames, so more pips are possible despite this strong trade entry. Strong signals like this happen routinely on the forex in the 8 currencies we track at Forexearlywarning.com, but since so many traders use technical indicators they always miss the pips. Using easy to interpret visual tools like The Forex Heatmap®, which monitor the strength of the currencies and money flows in real time, you can trade like a pro. Currency traders who like our real time currency strength tools can have a big advantage if they use currency strength to analyze the entire market every day. Always knowing the overall condition of the market, based on trends will raise the bar even higher and complete your overall currency strength trading system. Analyzing the market to determine the strongest versus weakest currency takes time but it well worth it, and your reward will be increased pips. You can set up some moving averages for all of the JPY pairs, USD pairs, NZD pairs, etc. to start. Then drill down the charts daily using multiple time frame analysis. For example if all of the JPY pairs are in up trends, then you know the JPY is weak. Then, if you can find a strong currency to go with it, you are in business to make pips. On the Forexearlywarning website, we show you how to set up the trend indicators, and how to analyze the market by individual currency. This way you will not only be trading in the direction of the daily market momentum, but also with the trend. 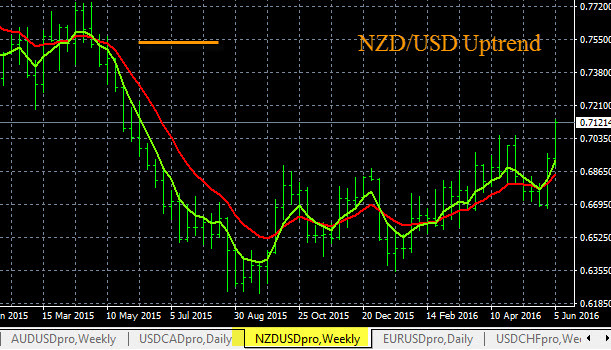 Today in forex trading The Forex Heatmap®, our live signal trading signal software, indicated a buy on the NZD/USD. A snapshot of the signal is shown below. This pair moved strong to the upside and it broke some resistance levels, it could be forming a trend on the larger time frames, like the W1 time frame. Therefore, we will be looking to set more buy plans on this pair going forward, as this pair has considerable upside pip potential from here. The heatmap provides live trading signals for 28 pairs and assists traders with trade entry verification and management. Today in forex trading the NZD pairs ha a trading alert on on The Forex Heatmap®. The New Zealand Dollar (NZD) was weak on all pairs. 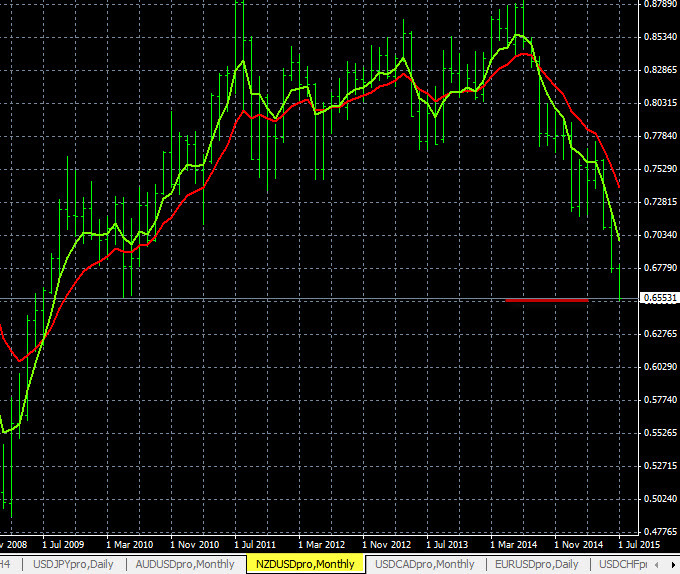 This drove the NZD/USD much lower and the EUR/NZD higher. Both pairs should continue in the same direction as they are both now back into their trends on the larger time frames. The trading alerts you see below are from The Forex Heatmap®, which provides trading alerts for 8 currencies like the NZD and a total of 28 pairs. The trend charts on the larger time frames show that the NZD/USD is currently in a downtrend. The current price is around 0.6550, you can set a price alert here to notify you of any movement. When the alert hits look for sell signals on The Forex Heatmap® to confirm the sell trade. The overall pip potential is excellent, possibly down to the 0.5500 support area, or even lower, which is around 1000 pips below the current support. No significant nearby support levels below the current price. The chart you see below is for the MN time frame, which is the largest time frame we use when conducting multiple time frame analysis on the 28 pairs we monitor. Today in forex trading the NZD (New Zealand Dollar) was weak on all pairs, and we saw live trading signals for these pairs on The Forex Heatmap®. The NZD weakness drove significant price movement. There was also consistent USD (US Dollar) strength and some GBP (British Pound) strength in the forex market today. The NZD/USD broke short term support levels and the overall pip potential remains strong as this pair is trending down larger trends and time frames. The GBP/NZD broke short term resistance to the upside and is also trending on the larger time frames and trends, we see ongoing potential here as well in the uptrend. The real time trading signals you see below are from The Forex Heatmap®, which provides live trading signals for 8 currency groups and 28 pairs.